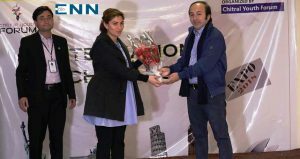 ISLAMABAD (ENN) Chitral Youth Forum (CYF) on Monday organized the first ever International scholarship expo 2018 in Islamabad which was attended by a large number of students, professionals and scholars. The expo, conducted at a local hotel, was specially designed for marginalized and socially excluded youth students of district Chitral, Khyber Pakhtunkhwa living in twin cities of Islamabad and Rawalpindi. The participants were given opportunities to interact with different alumni who gave them presentations and consultation on different scholarship program like Fulbright, Erasmus, AusAid, Chinese, SUSI, UGRAD, and YES. Vice Chairman Gilgit Baltistan Investment Board, Raja Nazimul Amin, the chief guest on the occasion, gave advices to the students who wish to get admission abroad. A large number of students, professionals and Mphil and PhD scholars visited the expo and looked to representatives from national and international educational institutions for career guidance and information. “The expo is a very good opportunity for students of Chitral to interact with the International scholarship holders, to discuss available opportunities,” Raja Nazim said. Speaking on the occasion, University of Bristol country manager and a well-known development expert Saifuddin said that the aim of the expo was to motivate youth towards their dreams. He said to make their dreams true every student should work hard and concentrate on the studies. Agha Khan Development Network’s Sherzad Ali said that comparing to the rest of the country the Chitral youth have very less opportunities and such events could play a vital role if provided them the right platform at the right time. He said according the statistics of the Government and other organizations district Chitral was comparatively at higher position with regard to literacy rate. He said in the whole scenario of literacy promotion and spreading education drive none of them had ever thought of the simple notion that what value being added to community through education. He said ignorance from all sides force to form the Chitral Youth Forum to guide educated youth in selection their destination. Asif Ali Taj, President CYF said that majority of youth visited the expo were eager to achieve more and go abroad for higher education. He said his team realized the thrust of the Chitral students and organized the event so that maximum could be benefited.